This painting reflects the compassion our Savior has for each of us and His willingness to give His life for us to know the depth of His love. 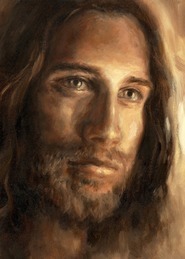 Every eye color is softly painted into Christ's eyes so that each viewer can see their own eyes reflected in His. 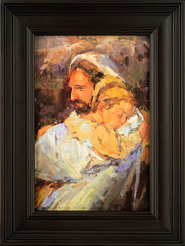 I feel that my father and little daughter helped to influence this painting from Heaven. The Savior is real. He lives. May we each personally experience the love of a very caring and Compassionate Christ. Kendra Parrish Burton finds joy in creating art and music compositions that inspire. 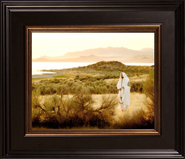 This inspiration is seen in her paintings Compassionate Christ and Jesus Heals which won “People’s Choice Awards” at the Inspirational Art Association Show and at the International Parliament of the World’s Religions. Her experience includes: Architectural drafting, BYU and ISU, studying artworks in Europe, New York, D.C., and working with Master Artists. She's shares through teaching art on television, showing her work in museums, galleries, Tabernacle Choir broadcasts, book covers, etc. Her musical composition “The Homeland” was performed by the Wasatch Symphony and a highlight of her life is working on temple murals.